We are pleased to announce the recent contract renewal for the provision of oil analysis services to SBB Swiss Federal Railways, Switzerland’s national rail operator of passenger and freight services. The contract renewal enables SBB to continue monitoring the health of all diesel engines in its cargo locomotive fleet, through the testing of used engine oils. 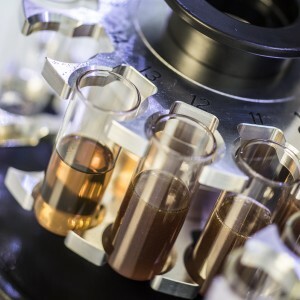 Over 1500 pieces of equipment will require analysis with the oil samples being analysed at the Spectro Swiss based laboratory, in Kaiseraugst. “We have been using Spectro for our oil sample analysis for our locomotive fleet’s diesel engines since 2004” said Christoph Pärli, System Engineer - Thermal Propulsion. “The quick turnaround of results and comprehensive reports enable us to plan our maintenance programmes and prevent unscheduled breakdowns, therefore giving us more control of our fleet as well as improved economy and reliability”. "We are very pleased to have the opportunity to continue our partnership with SBB, one of the most prestigious names in the rail industry” said Alan Baker, Sales and Marketing Manager of Spectro | Jet-Care. “With over 40 years experience in providing laboratory analysis services to companies around the world our understanding of our clients and their operations has culminated in our ability to provide a respected and recognised quality service to companies like SBB”. By taking a tailored approach to each client and combining high standards of customer service, we able to provide an independent analysis service that can give an accurate assessment of oil life and early warning of any problems, therefore avoiding unplanned downtime as well as to secure optimum maintenance cycles. In-depth analysis alongside technical guidance from experienced engineers and laboratory technicians provides a much enhanced service, available from our three laboratories located in the USA, UK and Switzerland. All three laboratories maintain the same exacting high standards and are supported by an industry recognised accreditation, ISO/IEC 17025; the testing and calibration laboratory standard.